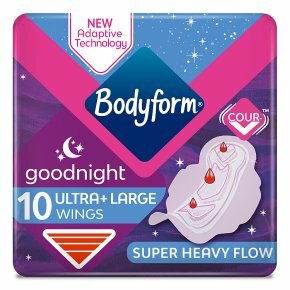 Bodyform Goodnight Ultra Towels have a specially shaped front and back to fit your body perfectly. They are longer and have wings to keep them in place, even if you toss and turn in your sleep. Bodyform Fresh Protect towels have a new ultra-breathable top layer with Airtech technology designed to offer a feeling of freshness. The unique SecureFit technology gives you both great comfort and incredible protection. We have combined our unique curve-hugging shape with anti-leak walls, a fast-absorption core and an all-around barrier so you can be ready for anything. Our Roll.Press.Go wrappers have unique self-sealing edges on all sides, so you can hygienically seal your used sanitary towel inside it, then dispose of it. And because the sealed Roll.Press.Go wrapper stays tightly secured even after disposal. Wear Bodyform, Live Fearless.